At Smith Family Dentistry, your dental health is our number one priority. As a leading dentist serving the Charleston & South Charleston areas, we're proud to provide a wide range of dental treatments to patients of all ages, and we strive to take an individualized approach to care. While much our treatment focuses on maintaining the health of the teeth, healthy gums are just as important – which is why it's crucial to take action if you experience bleeding gums. Gums that are red, swollen or bleeding may be caused by a mild form of gum disease, known as gingivitis. This is an inflammatory reaction to a bacterial plaque that can build up at the gum line when a person isn’t maintaining an effective daily oral hygiene regimen. This gum inflammation is a sign that your body’s immune system is attempting to get rid of these disease-causing bacteria. Unfortunately, these gum tissues aren’t likely to heal as long as the plaque remains on the teeth. In fact, this disease can even worsen into a more serious problem known as periodontitis, which causes bone loss around the teeth. 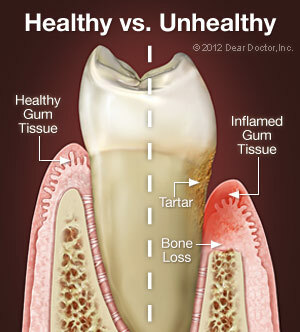 When this condition is left untreated, periodontitis can eventually result in loose teeth or even tooth loss. While the irritants in plaque are responsible for causing the bleeding, some people can be even more prone to developing gingivitis and bleeding gums. Some factors that can cause this include heredity, hormones (especially for pregnant women), and those undergoing puberty. If you experience bleeding gums, the best thing to do is make an appointment to see us as soon as possible. We'll perform a thorough oral exam and recommend the appropriate gum therapy, which will remove the hardened plaque deposits that can cause gum disease. Mild cases of gingivitis will normally heal after this procedure, but more advanced cases may require further treatment. In more advanced cases of gum disease, we may recommend a procedure called scaling and root planing, where we thoroughly clean both the exposed part of the teeth and the tooth roots, removing bacteria below the level of the gum line. After your gums have been treated by your Charleston dentist, you should then boost your oral hygiene regimen in order to help prevent your bleeding gums from reoccurring. Make sure to brush a minimum of twice each day using a soft brush and a fluoride-containing toothpaste. You’ll also want to floss at least once every other day as brushing by itself won’t remove enough plaque to ensure that your teeth and gums stay healthy. We’ll be glad to go over proper brushing and flossing techniques with you if you would like. Bleeding gums can be unsettling to experience, but don't worry, we are here to help! Feel free to call us at (304) 343-9131 if you have any questions, or request an appointment online if you'd like to schedule an appointment. We can't wait to hear from you, and we're looking forward to helping you achieve a healthy smile!